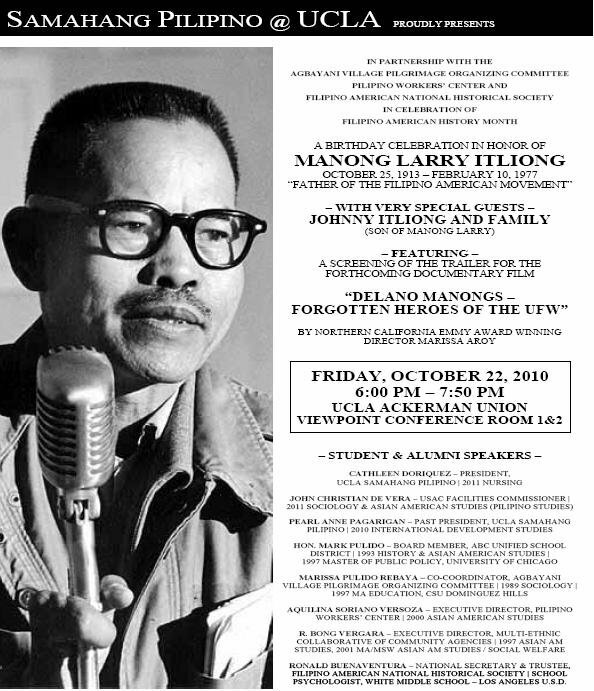 On Friday, October 22, 2010 at the Viewpoint Conference Room in Ackerman Union, UCLA Samahang Pilipino celebrated what would have been Manong Larry Itliong’s 97th birthday. Alumni had an opportunity to share some remarks; this is an abridged version of mine. I have a reflection and a challenge. Both are fitting with the economy being poor, and as many of you think about next steps. Here’s the reflection: What is the purpose of an education? Some say it is knowledge, but I want to amend it. Education does enrich and allow us a better understanding of what’s happening around us. But as the example of the Manongs tells us, it is not enough to have knowledge, it is not enough to understand what’s going on. We also need to use our knowledge and turn it into action, into service. Education turned into service builds value. The courage of the Manongs to mobilize and get organized not only had impact on the farmworkers among them back then, it had an impact on generations of farmworkers after them. The many unheralded community workers, educators and community leaders who came before and after them also did the same. They built social value in turning their deep understanding of their circumstance into an opportunity to transform lives. As you consider your next steps after college, know that there is an alternate possibility. You don’t have to work for someone else. You can build value. You can turn your understanding of the world around you into an opportunity for others to thrive. And so here is the challenge: as many of you no doubt will move on to a professional degree, law school, med school, as others of you go on to get your master’s and PhD, and as many of you leave campus grounds to go directly into the labor force, know that there is an alternate possibility. You can build value; you don’t have to work for someone else. Follow the example of Manong Larry Itliong, Manong Philip Veracruz, Manong Pete Velasco. Have the courage and confidence the Manongs had. Remember this moment and the emotional remarks of Jonny Itliong you just heard. Use your imagination to take an issue, understand it, and figure out a way to fill the void and help others. There is an alternate purpose to education: it is public service, and with it you can build value. This entry was posted in fatherhood, filipino, filipino american, filipino american history month, john delloro, larry itliong, manhood, politics, purpose of an education and tagged Cesar Chavez, delano farmworkers, Delano Grape strike, Dolores Huerta, filipino, filipino american, johnny itliong, Larry Itliong, life, manongs, pete velasco, Philip vera Cruz, UFW by rbvergara. Bookmark the permalink.